Posts: 1434 The lineup for this year's Glastonbury festival has leaked online, continuing the misfortune surrounding this year's event. While the announcement of those performing at the festival is usually a closely guarded secret, the lineup has appeared in various places on the web two days ahead of its official announcement. The news comes on the back of poor ticket sales and controversy over the choice of headline act, rapper Jay-Z. According to the leaked lineup, Jay-Z is to headline Saturday night on the Pyramid stage, ahead of a "very special guest" who remains unnamed. Returning Bristol heavyweights Massive Attack will lead the Other stage on the same night. Friday will see American acts Kings of Leon and Panic At the Disco take top spots, while the festival will be wrapped up on Sunday by the Verve and Groove Armada. This year line up is awesome, there are so many bands/artists/dj's that I'd love to see - I can't believe everyone was whinging about Jay-Z. I'm not going to get excited though, there are ALWAYS acts I'd love to see at glasto but I'm always off somehwere else doing something random (I spent about 3 hours one year making steam boats to float on a paddling pool). Posts: 9 All this rubbish about Jay Z......nevermind!!! 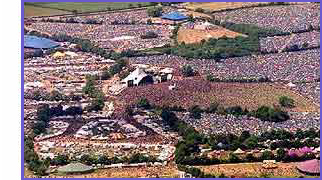 Itll be my 1st Glastonbury and im counting the days already!! Dont think they ll be such a vast and varied line up at any festival this year, cant wait to see Kings of Leon.....right at the front for that 1!!! !